→How to cut crown molding with a compound miter saw like professionals? Compound miter saw is used by wood lovers all around the world. You can use it for small do it yourself projects at your home like making frames or cabinets. You can also build a small wooden house for your pets. Floor makers and craftsmen use compound miter saw for cutting perfect tiles and wooden panels. 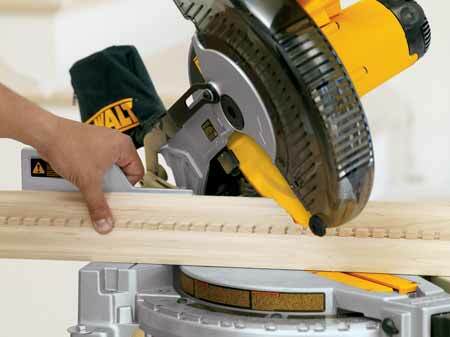 The biggest benefit of using a compound miter saw is the accuracy and flexibility in usage. It is known for cutting precise angles or square and beveled cross-cuts. So in a nutshell, the compound miter saw is a very useful power tool and can be used for a variety of purposes. The joints in the crown molding are called compound because the cuts at every side have two angles. These angles are the miter angle and bevel angle. You can see the biggest benefit of compound saw in this way that the blade of the saw can be tilted to cut the bevel angle and it can be easily rotated to cut the miter too. So you don’t have to make two cuts and just making one single cut can serve the purpose. Another benefit is that you can lay the molding on the table which is very helpful for wider moldings. First of all make sure that you have all the things that are required for cutting a crown molding. These things include compound miter saw, molding, a dust mask and a pair of safety glasses. Wear your safety glasses and dust mask and look for the angles on the saw. Preset the angle to 90 degree and start cutting. Nowadays the compound miter saws have preset angles for crown moldings. But if your saw is manual or there is no preset angle, you can simply do it in a minute.Just rotate the miter saw on the left side or anti clockwise and set the angle at 31.6 degrees. Then rotate the saw again and set the bevel angle at 33.9 degrees. Then pick the molding and place it on any flat surface or most conveniently on the saw table so that it is not movable. Make sure that the finished side of the molding is facing upside. Then slide the molding to the right side of the blade to cut a piece at right hand for an outside corner of the crown. Use clamps for holding the molding or just hold it yourself and start cutting. For cutting the left and right inside corners, place the molding upright and rotate the saw to set miter angle at 31.6 degrees. Again set the bevel angle at 33.9 degrees. Then make cut just like you did before. Don’t forget to read the instructions manual before operating the type of compound miter saw. Understanding the functioning of the saw is very crucial in order to avoid any injuries. Always wear glasses and dust mask. Any injury to your eye can prove very dangerous if not taken care of. In case your compound miter saw is making noise, using ear plugs is a wise decision.